Besides the stylus engravings, GRT employs different laser technologies of the companies Think Lab., Japan and Schepers, Germany. Both technologies are mainly used for the reproduction of line work. Especially the Japanese installation is particularly excellent for its very fine detail resolution and the high degree of flexibility in screen definition. 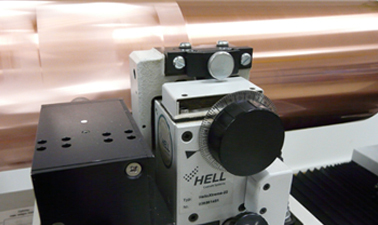 Both the exposure process as well as the etching process are bound in an automated production line. An optimum in process control during production of the print forms, guarantees our customer best results in their products. Due to the high resolution of this technology, GRT is able to offer its customers the finest and most precise reproduction information available. 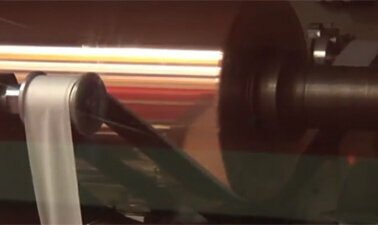 The smallest micro text heigth possible in a roto gravure print form and an optimum screen definition are characteristics of this production system providing not only the security market but also our packaging customers outstanding advantages. 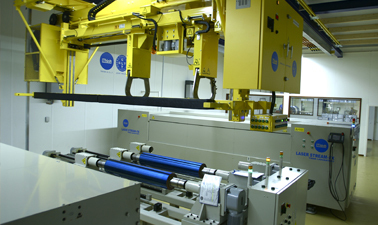 The Schepers direct laser is used for standard production of packaging designs as well as for special embossing applications or generating three dimensional structures that use different techniques respectively. In the field of applications, GRT is using this future technology in the best possible way.